Sainsbury's Bank's former chief executive Hamish Taylor stressed the value of live events during C&IT's Brand Book Live Event last night. Taylor said: "There is no doubt there are huge advantages [to live events]. They are face to face, you have a greater chance to have discussion with people you need to influence, and people can ask questions." AstraZeneca, Axa PPP Healthcare, Porsche, Friends Provident and Roche were among brands attending the event at the Penthouse Leicester Square on 1 September. "I do believe live events are powerful, but on one condition," added Taylor. "They have to come from a customer benefit model. Live events are not an end in their own right; they are about getting the customer benefit message across, and that way they are worthwhile." Taylor shared examples of brand management from his experience as managing director at Eurostar, chief executive of Sainsbury’s Bank, and head of brand management at British Airways. He told gathered corporate event planners and agencies including Euro RSCG Skybridge, Smyle, BSI, Top Banana Team and W&O Events that it was critical to recruit business leaders to ensure success. "As marketing people we have to stop recruiting marketing people and start recruiting business leaders," said Taylor. "You need to have people in the marketing department that can influence the rest of the business." 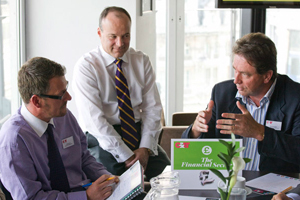 Six sector roundtables at Brand Book Live saw event planners debate the health of each sector and identify the top brands driving event marketing in the financial, automotive, consumer goods, pharmaceutical and retail sectors.